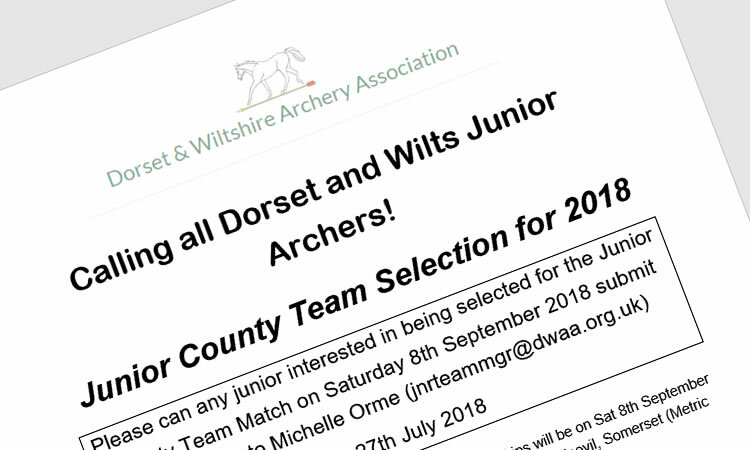 Calling all Dorset and Wilts Junior Archers! The GWAS Regional and Junior Inter-Counties Championships will be on Sat 8th September 2018 at Yeo Bowmen, Johnson Park, Yeovil Sports & Social Club, Yeovil, Somerset (Metric Rounds). Refunds for entry will be given to successful team members. Please submit your scores from any Open or Record Status Bristol or Metric rounds shot at the appropriate distance for the junior’s age on the day of the competition. At least one score must have been shot in the current season. Parent/Guardian name, contact email and phone (so you can be notified of selection over the summer), Junior’s name, Archery GB number, date of birth, Club, bow type, and for each score, date and location of competition, round, score, hits, golds/tens. *GDPR: note information will be used for DWAA Junior Team selection only, information will be passed to the tournament officer should you be selected for the inter-counties competition.